Cup Final fever…allez les Bleus! Seven this morning and I’m on my way to the market in Castres. 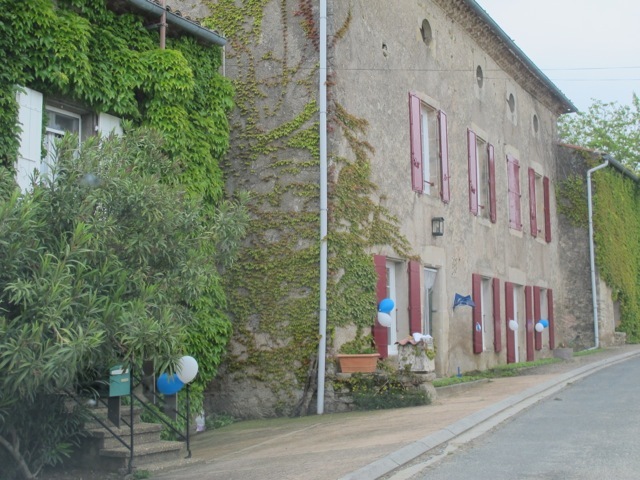 I pass through the next small hamlet which has white and blue balloons hanging from the front doors and windows. I’m reminded that this evening there is a match in Paris at the Stade de France and that Castres Olympique, whose colours are white and blue, are one of the two teams involved. It’s the final game of the French rugby season–which decides the top team of 2013. I continue on my way but am held up by a large white coach gallumphing through the narrow country lanes. I get close enough to see it’s full of people. Seven o’clock on a Saturday morning! Never seen such a sight. Ah!–must be on their way to Paris for the match. I pass several small groups of bleary eyed people gathered round single cars all wearing tell-tale blue and white scarves and hats–must be on their way to Paris for the match! I later learn from the fish-stall in the market that 39 coaches are doing the seven hour trip up the motorway. A number that has increased at each stall I shop at! Ten thousand people are on their way, I’m told. No wonder the market seems empty–not just because the weather is dismal, making it difficult to grow things–everyone’s on their way to Paris for the MATCH! And why not? This could be an historic day. 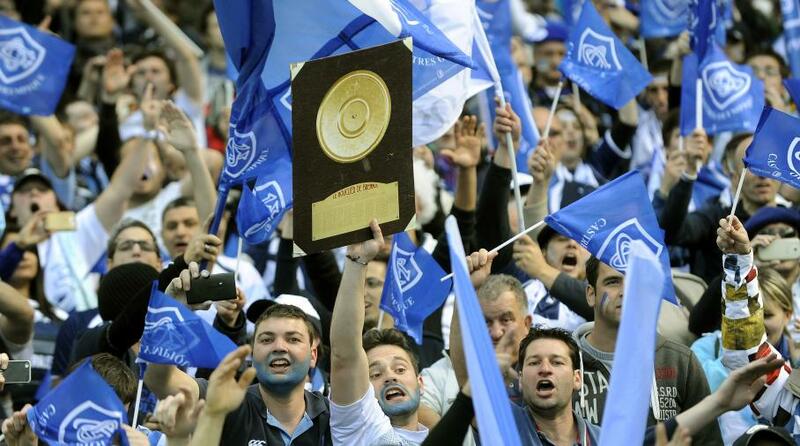 Castres Olympique last won the cup in 1993. Twenty years is a long time to wait for another chance. But it is going to be tough. Toulon, the opposing team, are favourites by some way and they have the advantage of English rugby-man Jonny Wilkinson’s right foot–a dangerous limb. He makes a habit of kicking teams to victory. He won the last-but-one World Cup for England on the last kick of the game. Castres maybe sparsely populated this morning but it’s awash with blue and white–and those left in the market are buzzing with anticipation. Dominique–from whom we buy our cheese–has two short stripes–white and blue of course–painted across each cheek. Tribal signs are everywhere. Balloons in shop windows, pendants hanging from lampposts and car aerials–no-one dare not display their allegiance today. I meet our neighbour Maïte–always early to the Saturday market and we talk–about which channel to watch the game on. She recommends Channel 2. I say everyone is so excited and happy. Oui—she says doubtfully–but there could be tears before bedtime. so who won Robin? Don’t leave us in suspense! CASTRES won 19 to 14–TRIUMPH! Champions of France. Congratulations to Castres. Robin,good on um. Congratulations for Castres although I have no idea of rugby. Today we’ll celebrate the triple for Bayern Munich despite bad weather. We have also a great french player in our team Franck Ribery! Here in Wisconsin the football team is the beloved Green Bay Packers whose colors are green and gold. All over this state, during fall and winter one sees those colors in clothing and outerwear. I have often wondered what the Martians would think if they came here during football season! I like the adelaide crows myself.